Every September, we get calls from customers who need inventory by November 1 for the Christmas selling season. By then, it’s too late. Not counting product development or sample approval time for new products, in general, production time is six to eight weeks for most products, depending on the purchase quantity and where the factory is in their production schedule, plus five weeks for transit time by sea, depending on the final destination. Chinese companies are closed the first week of October for their fall holiday, which adds another week. An order placed September 15 would need 3 months to get here, meaning you’d receive the shipment around mid-December, assuming there are no hang ups with U.S. Customs. For companies that need inventory in hand for the Christmas selling season, the latest an order should be placed is July 15. This would give you a little cushion in case there was a snag; you should see your shipment by mid-October. Orders for new projects requiring new molds, tooling, or samples should be placed immediately. The mess in China’s stock market has been seemingly lost compared to the recent media coverage of the Greek default. In the past few weeks China’s stock market has tanked 29%, wiping out more than three trillion dollars of Chinese wealth. Only 1.5% of China’s stock market shares are foreign owned, which means most of the loss is contained in their domestic market. China has responded by cutting interest rates, halting new IPOs, pumping a little money into their stock market with a plan to invest nearly 20 billion US dollars (120 billion yuan) in a market fund, and limiting margin trading (stock investments made on borrowed money). For now the consensus seems to be that the damage from the stock market earthquake in China will be contained to their country as long as it doesn’t keep falling… which is the big question. If the Chinese stop spending and importing products from other countries it could start affecting the global economy. Let’s hope not. China has 200,000 traffic related deaths annually, with 20 million new vehicles added to the streets each year. 35% of drivers rate themselves as angry. Xie Fuzhan, governor of Henan Province. China holds $1.26 trillion worth of US bonds, 34 billion more than Japan. 440,000: the number of followers Tim Cook, CEO of Apple, added in the first day after he set up an account with Weibo, China’s version of Twitter. Cook visited China in May, and is the first CEO to do so. 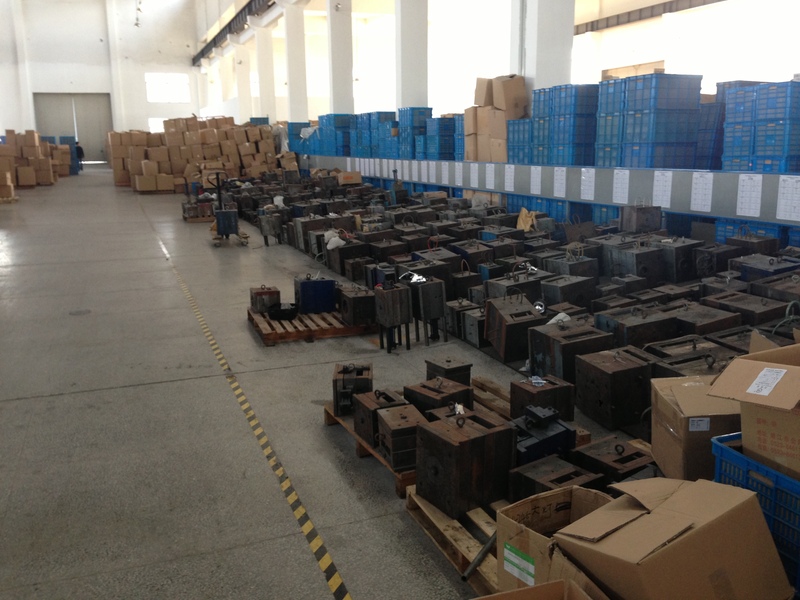 Above is a picture showing the steel plastic injection molds one factory in Ningbo had that I visited in 2013. This was just one room of one of their buildings; there were many more molds they were storing. Chinese manufacturing companies can’t hold on to molds indefinitely due to space limitations. After a mold sits unused for more than three years, the factory may dispose of it. Every once in a while we are contacted by a customer who hasn’t used their mold for five years or more; by that time the factory has scrapped them. Storage options should be discussed for molds that have not been used for three years or longer. * Engineer’s drawings with all dimensions, tolerances, and material requirements, and/or a sample to send. Sometimes pictures with all major specifications will work, if it’s a simple product. We can refer you to a company that can do engineering and prototyping if you need these services. All material copyright 2015 Global Trade Specialists, Inc.